Copper is well known as the red metal, and equally well accepted as a green metal. Green because copper is durable, easily remelted or re-refined, and economic to recycle. In 1997, 1.45 million tonnes of copper were recovered from scrap processed in the United States and another 379,000 tonnes of copper and copper alloy scrap were exported. Total US production of primary refined copper, from domestic ores and foreign materials, was 2.06 millions tonnes. Roughly two-thirds of the copper-containing scrap was new scrap and one-third was old scrap (see accompanying page on terminology). Copper is durable. It maintains its electrical conductivity and generally does not deteriorate or corrode over time. As a result, copper is often used in products designed to last a lifetime, or longer. In 1997, building construction accounted for nearly 42% of US copper consumption, up from 22% in 1960. There is much more copper used in a home today than there was 50 or 100 years ago. The infrastructure of a building may be expanded or modernized, but the copper wire and tube and brass fittings in a home or office seldom need replacing. Because of copper's long life, and because older homes have less copper in them than today's structures, there is only a small amount scrap available from the building and construction sector. For building wire, tube and fittings, the old-scrap recycling rate, i.e., the ratio of old scrap consumption to total copper consumption is relatively low compared to steel, aluminum, and plastics. The reason for this is that packaging products (a major end-use for steel, aluminum and plastic) have a lifecycle of only a few weeks and may be recycled several times a year. Copper based products, on the other hand, tend to have very long lives. This limits the supply of copper scrap to be used for recycling. Electrical and electronic applications was copper's largest market in 1960, accounting for 28% of the total. In 1997, this was copper's second largest end use, with a 25% share. In many electrical products, such as power cables, busbar, transformer windings, motors for heavy appliances, and telephone wires and cables, copper has a long life and may not become available for recycling for 20-50 years after it was initially put in use. Others copper-containing electrical and electronic products, such as small appliances and consumer electronic goods, have a shorter life, perhaps on the order of 5-10 years. Commercial electronic products and large appliances are usually recycled, as they may contain precious metals along with the copper. Although, the recycling rate is lower for small consumer electronic items, these contain very little copper. With rapidly changing technology in the electronics area, some older, copper-containing products have become obsolete. For example, in the 1980s telephone switching stations and central offices were a major source of copper and copper alloy scrap, as the advent of digital switching made these bulky, metal-intensive units obsolete. 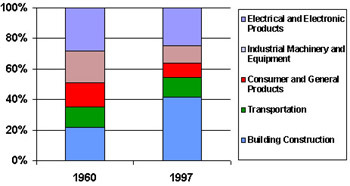 Transportation equipment is copper's third largest market with 13% of the total, about the same as in 1960. Although the importance of the transport sector hasn't changed, the pattern of copper usage is very different. For many years, the automotive radiator was the most important end use in this sector; however, copper usage in automotive electrical and electronic applications has grown rapidly while the heat exchanger market declined. Cars have an average life of 10-15 years, and almost all of the copper, including the radiator and wire harness, is recovered before the body is shredded and recycled. Industrial machinery and equipment is another application where copper generally has a long life. However, the use of copper this market has not been growing and now accounts for only 12% of usage, compared to in 21% in 1960. The relative importance of consumer and general products has also declined, from 13% of the total in 1960 to 9% in 1997. Coinage or ordnance are major product areas in this end use. Bullets are seldom recycled, and while some coins may be melted down, many are in the hands or collectors or savers and not available for recycling. Copper and copper alloys are easily recycled. The United States has a well-developed infrastructure that provides copper scrap to smelters, refineries, brass mills, foundries, ingot makers and others. These processors require copper scrap for process and/or cost control. Some 19% of the copper recycled in 1997 was processed by smelters. The bulk of the copper smelted in the US comes from primary smelters that are integrated with mining operations. Most of these plants do not use scrap, although some may buy a small amount that is used to control the temperature of the molten copper in the converter. In the United States, there are two secondary copper smelters, Chemetco's plant in Illinois and Southwire's facility in Georgia, that processes copper scrap. Much of the feed for these plants is unalloyed old scrap that must be upgraded before it can be reused. Most of the primary refineries in the United States rely on blister or anode from primary smelters as their main source of feed. A few, though, will process some high grade, No. 1 scrap or purchase blister and/or anode derived from scrap. Generally, fire refined ingot or cathode produced largely from secondary material cannot be used in all applications. Most of this material is used by brass mills. Secondary cathode may not be suitable for fine-wire applications and would be used primarily in building wire applications. Some is mixed with cathode from primary refineries and used in other wire and cable operations. Southwire uses high-grade scrap to produce cathode that is used along with purchased cathode in its wire and cable operations. Warrenton Refining, another scrap-based operation, produces fire refined ingots. Reading Industries and Cerro Copper operate scrap-based fire refineries that produces feed for their tube mills. Noranda , in Canada, and Asarco, use high-grade scrap in their primary refineries. US refineries process about 10% of the scrap recovered in the United States. Brass mills are the largest US consumers of scrap, accounting for just over 50% of total scrap consumption. The brass mills use both copper and copper alloy scrap. The material must be high-grade, as it is simply remelted, with no refining possible. Much of it is new scrap. For example, a large proportion of the scrap at alloy rod mills is return scrap from customer's operations. Return scrap is also an important source for strip and sheet producers, but tube mills rely on purchased scrap rather than tolled material. On average, scrap comprised 56% of the US brass mills' copper requirements. 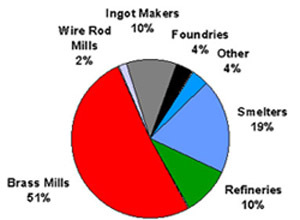 Ingot makers and foundries rely on scrap for most of their copper, and in 1997 scrap accounted for 93% of their copper needs. Because the material property requirements for cast products are generally less stringent than for rolled and drawn products, ingot makers and foundries can use the lower grades of copper and copper alloy scrap. Copper has a high intrinsic value, and it makes economic sense to recycle copper. The infrastructure of scrap collectors, dealers, processors, and consumers was developed without municipalities incentives or return programs. When brass mills take back scrap from their customers, the price for this scrap is often about 90% of the metal value in the scrap. For example, when brass rod mills adjust their prices, they set figure for the "brass rod metal value selling price" and the "buy-back price for customer-returned turnings". In the US market place, copper scrap generally sells at a small discount to the copper price set on the Comex exchange. In 1998, copper scrap sold for about 98% of the price of virgin copper.